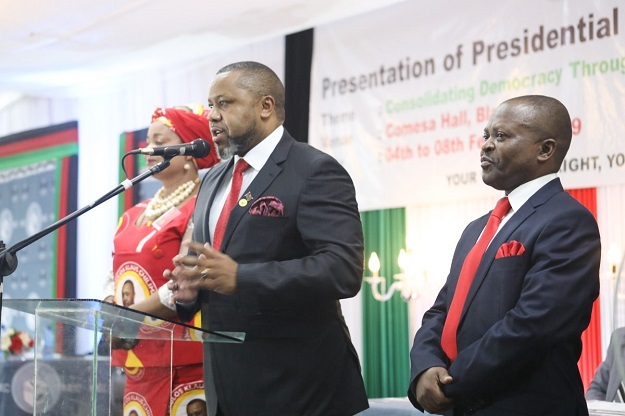 Malawi’s Vice President and UTM Party President Dr. Saulos Chilima has settled for the party’s Director of Strategy Dr Micheal Usi as his running mate. He made the announcement after presenting his presidential nomination papers to the Malawi Electoral Commission (MEC) at Comesa Hall in Blantyre on Wednesday. “We have taken one of our own. Therefore this morning I have the pleasure to introduce Dr Micheal Usi,”he said. While admitting that it was tough to make this decision Dr. Chilima said he is hopeful that together they will make it in the May 21 polls. Chilima also commended the Alliance for Democracy (Aford) and Tikonze Peoples Movement for joining forces with UTM party, saying this is a sign of maturity in politics. His remarks follows the withdraw of Former Malawi president Joyce Banda’s People’s Party (PP) from the UTM, PP, Tikonze, and Aford Alliance, citing betrayal by UTM. Usi is a well-known social-political activist, movie actor (aka Dr Manganya) playwright and musician. He has also been a long time director of the TV series Tikuferanji. The UTM Vice President, worked for a long time as director for Adventist Development and Relief Agency (ADRA). Usi graduated at the University of Bedfordshire in United Kingdom where he has attained a PhD. His doctorate degree research was focused on the development of Malawi by investing in the country’s youth.